If you're vegetarian or from PETA, skip this post. You've been warned! Food master (chef, author, TV host) Anthony Bourdain finally visited the Philippines and the show was on last week (and it took me this long to post about it because my new Nine West shoes and new Gucci bag totally distracted me!). Vince and I love his show "No Reservations" because we loooove food and any show that tackles food is a good show! Anthony's is different from most because, unlike most people, he has a very open mind on food and he tells it like it is, so if he says it's good, you betcha it's good. And if it's bad, I'll take his word for it, too. Other hosts are such huge fans of their own food (usually bland) that they can't appreciate the cuisines of other cultures. 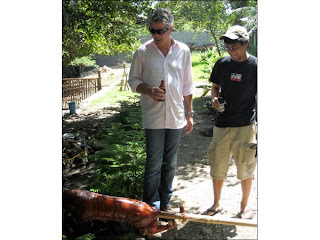 So when he came over and said that our lechon, or roasted pig, is the best in the entire world, well, I assure you that a lot of pigs will get roasted as Pinoys all over celebrate the fact that Anthony Bourdain just proclaimed our lechon as the "Best. Pig. Ever!" I just want to say that, while "No Reservations" is a food show, he tackled one mighty question: Who is the Filipino? It really bothered Anthony that if our food's so good, why isn't it on the culinary map? Why aren't we promoting it and pushing it because, to him, the few dishes he ate were some of the best-tasting stuff he's ever had. Hell, yeah! Pinoy food forever! In fact, our food is so good, Filipinos are fast becoming a nation that desperately needs the best diet pill ever! Tee hee. Anyway, this is a very serious question that applies to all aspects. I've had the opportunity to meet many foreigners. When the hosts of "Queer Eye for the Straight Guy" visited, they were surprised to see how fashionable Filipinas are, which begs the question: Why aren't Filipinos on the fashion map? Some American and European friends of mine who've been to many beaches and diving sites all over the world visit the Philippines and get so flabbergasted at how beautiful our shorelines are, which begs the question: Why aren't our beaches--the very best in the world!--in the travel books? And so on and so forth. "Our identity has always been debated on. Everyone says we have none because--like you said--we are too nice and struggle to please and be integrated. But underneath that, there is a Filipino identity, very subtle, but we recognize it in each other as soon as we step out of the country. Like you said, Filipinos are nice. And everywhere in the world, if you meet a friendly, smiling, eager-to-please, kind, happy, funny, all-suffering person, I bet my life you just met a Filipino. "And I want to add that the Filipino identity is wrapped around food! Why do you think your show has so many Filipino fans, it makes you nervous? =D As long as it's about food, Filipinos will devour it!" If you're Pinoy, stand up and be proud! And let's have some lechon while we're at it! YUM! oh I want to go there now and taste your food and culture! and i must say that the cebu lechon is the best tasting lechon, ever! haha. Love the show! Love the dishes he featured! Made me crave sisig (we get most of everything here, except a really good sizzling sisig, and oh, bulalo with deep fried tawilis... and... lol, I guess there's more). You know what? The cooks here in Dubai are actually trying to integrate Filipino dishes in the menu - in a posh cafe in Dubai Media City, their buffet used to serve Bistek Pinoy (or Filipino-style beef steak). Chowking, though it's a mix of Pinoy and Chinese dishes, is doing pretty well here, and not only with Pinoys. In general, I would say, we lack in presentation. A dish must look yummy, not only taste yummy. And that's a dream I and fellow UPians have here - putting up a Filipino restaurant that truly represents the Filipino cuisine. A posh one, mind you, not the carinderia type, to finally elevate it to international standards. Bucca and Heart and Elbow, come on over and have a feast! eMz, I know. It made me super hungry! 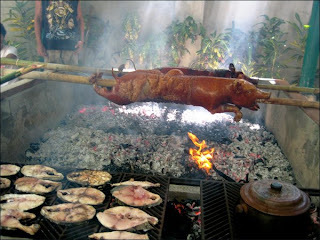 Kaith, Cebu's lechon is realy very good. My friend, Kate, who is from Cebu, regularly has it shipped here to Manila for her parties. And that's all it takes for all of us to show up! Shorty, ya, the Philippines is a great surprise but sometimes I wish we were more OUT THERE! Ria, wow! That is good to know =) Is the Chowking there the Chowking here? Ya, that's the problem with Pinoy food. We're grub.